look at some great items to include in them. There are truly a wide range of items that can be included in gift baskets and we're pleased to offer some of the lowest prices online, and in Canada, on baskets that include these items. From corporate gifts to something for you're sweetheart, and whether you're interested in some of our value-conscious assortments or an exquisite gourmet collection, you can't go wrong with the following options. Chocolate is always a great option -- it's addictive and delicious. 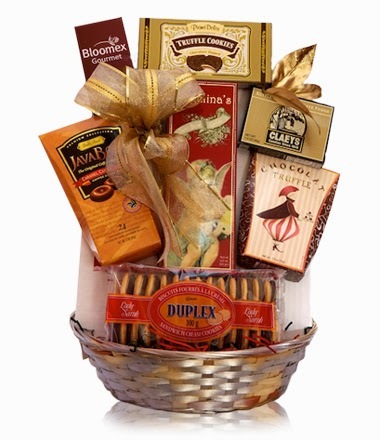 Staying with sweets, many baskets include some types of cookies. Switching over to salty rather than sweet, nuts are an excellent item, sure to be munched on throughout the holiday season. And for refined tastes, cheese (particularly paired with a bottle of wine or something similar) is an elegant way to surprise your loved ones at Christmas. This may seem a little bit left-field, but we also offer baskets featuring things like seafood to make for a truly unique gift giving experience. Escargot: Speaking of refined tastes! Yep, we've got baskets that have Escargot in them. Mmm. Tea: It's the most popular drink in the world and makes for an excellent inclusion in any sort of Christmas present. Wine: Classy and elegant, wine is a traditional gift -- great for housewarming parties, but just as good for a Christmas gathering or a holiday present. Beer: For the fun-loving man (or woman) in your life, Bloomex's Beer and Nuts basket is a very popular choice among our customers. As a footnote, if you really want to do some good this holiday season, have a look at our Charity Give Baskets, where 20% of your purchase goes to a charity or non-profit organization of your choice.